Today’s pretty ribbon-style Zari tangle comes from new tangler Veena Arun and it’s her first on the site. “I am a housewife and full-time mom born and raised in India and currently living in Redmond, WA. Growing up, I was always inclined towards art. Dance was my passion but I had to give it up because of damage to my knees. That’s when I started trying out different art forms. I knew I needed something creative to help me stay sane! In my search I discovered Graphic Design and Zentangle®. I first stumbled upon Zentangle a couple of years ago but didn’t really get into it so much until recently. Needless to say, I am completely hooked and feel disoriented and lost if I miss a single day of tangling. I love creating tiles and ZIA. I am discovering and learning everyday and am enjoying the process thoroughly. I hope to become a CZT someday! The inspiration for Zari comes from childhood memories of my mother and her beautiful silk saris. I have fond memories of watching my mother drape those beautiful saris with wide borders embroidered intricately in fine gold thread. They always caught my attention and this pattern of mine took me back in time. 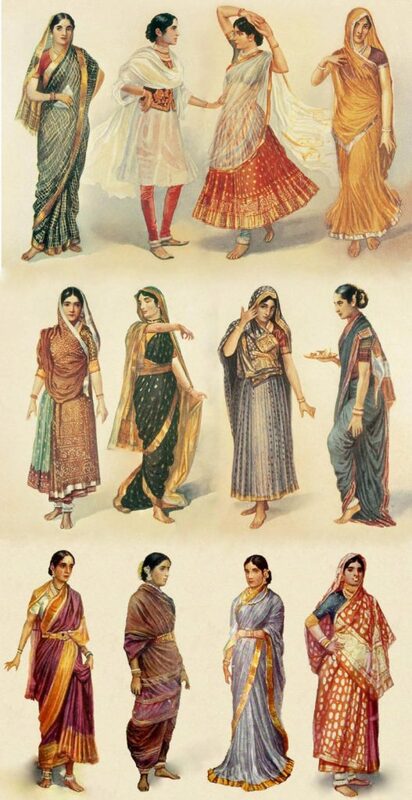 “A sari, saree, or shari is a female garment from the Indian subcontinent that consists of a drape varying from five to nine yards (4.5 metres to 8 metres) in length and two to four feet (60 cm to 1.20 m) in breadth that is typically wrapped around the waist, with one end draped over the shoulder, baring the midriff. There are various styles of sari draping, the most common being the Nivi style, which originated in Andhra Pradesh. Watercolor Illustrations of different styles of Sari & clothing worn by women in South Asia. By M. V. Dhurandhar. As as for Zari – lovely, easy. Can’t beat that. 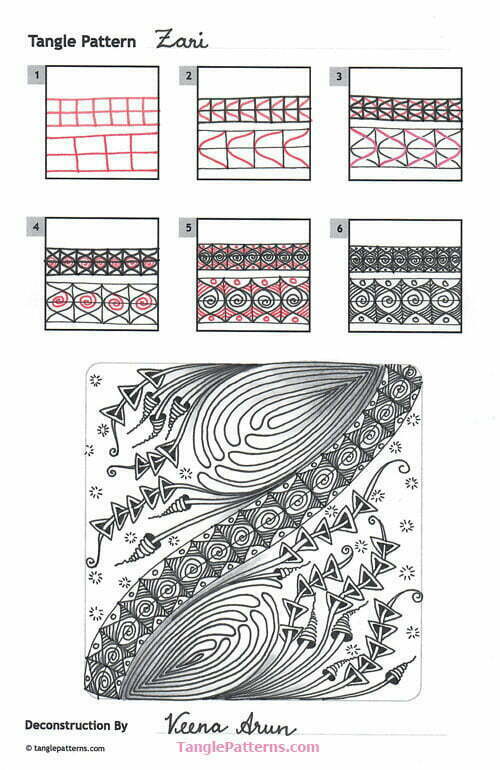 Veena illustrates the step-by-step instructions for drawing Zari below where she features it in a festive Zentangle tile with the Zentangle originals Mooka, Rixty and Zinger, and some fizzy bursts of Antonine Megger’s CO2. Check out the tag veenaa for more of Veena’s tangles on TanglePatterns.com. Veena, you Zari pattern is lovely… thank you for sharing with us… I have already started using it. I love your beautiful sari story, and what you did with the tangle is beautiful as well. Your zentangle tile is wonderful. You are doing great! This is the first time I have left a comment. Beautiful new tangle, thank you very much for sharing Veena! Your Zari pattern brings me back to my college days fifty years ago, when we decorated our apartments with textiles that featured designs similar to yours. Window curtains, bedspreads, wall hangings made of these tapestries were a hallmark of the culture of the day. Seeing your design has made me glad to have those memories! It was truly a time when art and music flourished, and much of it was inspired by the artists, musicians and philosophers of your mother’s homeland. Thank you for sharing your lovely pattern! Susan, I was totally there with ya! 😀 In fact, I think I still have one of those bedspreads stored in some drawer somewhere. Thank you for bringing up all those memories. Veena, this is a very lovely tangle and so nice to draw. I’ve already started playing with it in my sketch book and have come up with some different small variations to play around with too (I think that means I really really like it :-D). Thank you for sharing it with us. Forgot to mention a thank you to Linda for all that wonderful information on Saris and the beautiful pictures. You do so much more than just have tangles for us to try out but you give us a great education too. Thank you so much! Very nice one. I tried it. Somehow I missed something and mine did not have a line down the length where the curls are, in the center. Either way it came out very pretty. Your tangle is spectacular! Thank you so much for sharing! Lovely tangle pattern. Simple and very easy. Remembering kanchivaram saree borders that my grandma n mum would wear. Great going there. I am from India. I am happy to find a tangle by an Indian. Yes, Zari (could be gold or silver) thread woven into beautiful borders in Indian clothes, especially silk and cotton saris. Thank you Veena for representing India. Great pattern. I’ve been playing around with it, and I’m sure I will be using it in a tile soon. This is a beautiful representation! Can’t wait to use it, Thank you! What a beautiful tangle, and one that looks far more difficult than it really is. Thank you, Veena for your lovely pattern, and thank you again Linda, for all your work in sharing these patterns. Wonderful border tangle! I love it in the round on a Zendala too. Thank you for sharing!